It’s strange to consider that your 4,000 pounds of car are resting on four inflated tubes of rubber as you speed down the highway. Tires are a critical component of your vehicle, and their proper functioning are critical to keeping you safe. When manufactured correctly, you can rely on a good set of tires to keep you going for tens of thousands of miles before needing to be replaced. Unfortunately, not all tires are manufactured correctly, and even what were once perfectly good tires may sit on a shelf for years before they get put on your car, and by that time they have aged past the time when they are safe to use. 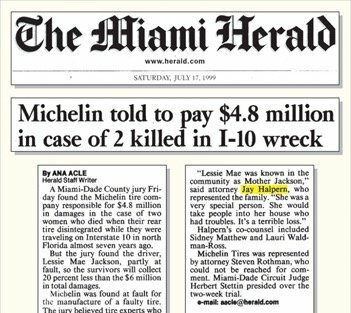 Eleven thousand tire-related crashes occur on American roads every year, according to the National Highway Traffic Safety Administration. In 2015, tire-related crashes were responsible for 19,000 injuries, and in 2016 733 deaths resulted from crashes involving a tire malfunction. 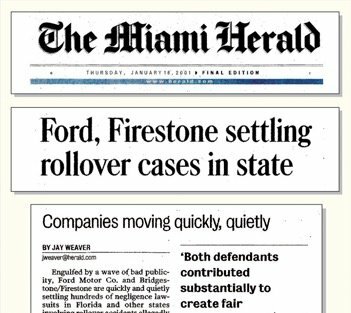 There is simply no excuse for the negligence of tire manufacturers or tire retailers who make, sell or install defective tires. 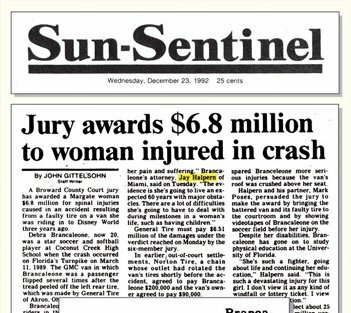 There is simply no justification for the thousands of needless injuries and deaths caused by defective tire failures. 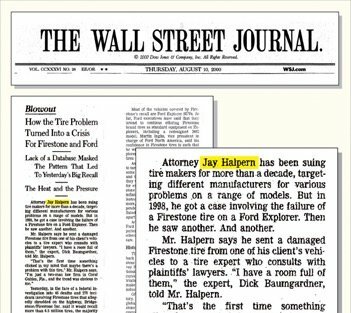 Holding tire manufacturers, tire service providers and others accountable for their misconduct is our focus at Halpern Santos Pinkert. 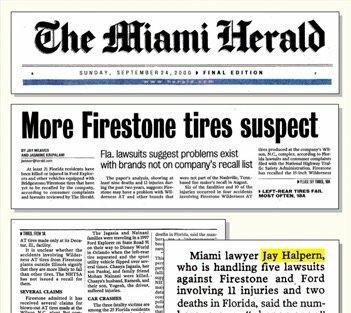 Our tire defect attorneys have gone up against every tire manufacturer in cases all over the country, and we have achieved immense success holding responsible parties accountable for the damage they have caused. 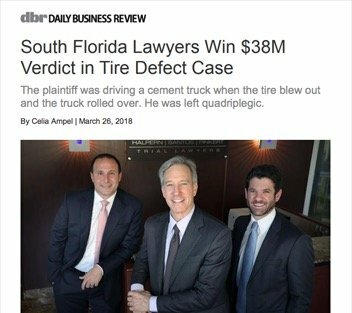 Tire Defects – Our lawyers are experienced and capable of litigating cases involving tire design defects, tire manufacturing defects, and even failure to warn defects where product literature and marketing materials promote an unsafe use of a tire or make an unrealistic promise of tire life. Our experience includes curing defects, bead failures, vulcanization errors and other mistakes leading to tread or belt separation, sidewall failures, tire explosions, and loss of vehicle control. 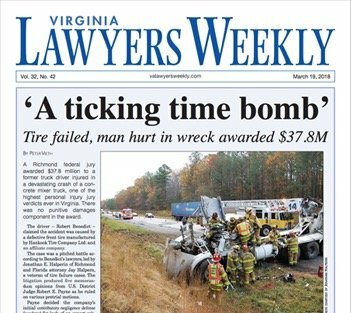 Our lawyers have particular expertise with tire aging defects brought on when old tires that are dangerously past their prime are sold or installed. 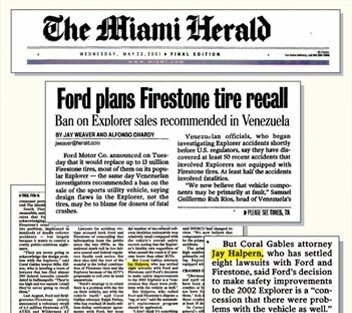 Tire Recalls – Tire recalls happen by the dozens every year, affecting thousands of cars, but car owners may not be provided the information they need in time to avoid a serious auto accident. 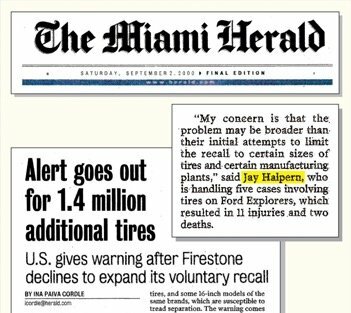 Some tire manufacturers initiate recalls only after a high volume of customer complaints, while others wait until forced into a “voluntary” recall by the National Highway Traffic Safety Administration. Truck Tires – Trucking companies are notoriously bad about maintaining the tires on their fleet in good condition. 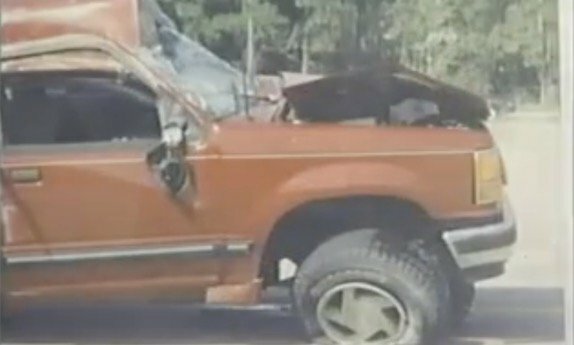 Truck crashes due to tire failure may cause catastrophic injury or death to smaller vehicle occupants. 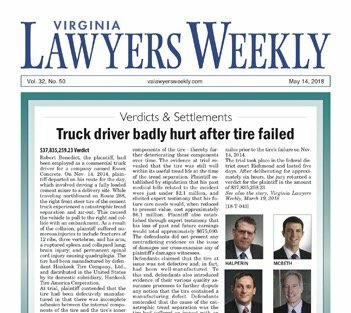 Drivers sharing the road with 18-wheelers also face danger from massive truck tires that shred off the trailer and slam into passenger car windshields or throw sudden hazardous obstacles onto the road. Tire Manufacturers – Tire makers who are too focused on their bottom line may use substandard materials in the manufacturing process or fail to oversee the process to prevent curing errors and assembly line mistakes. 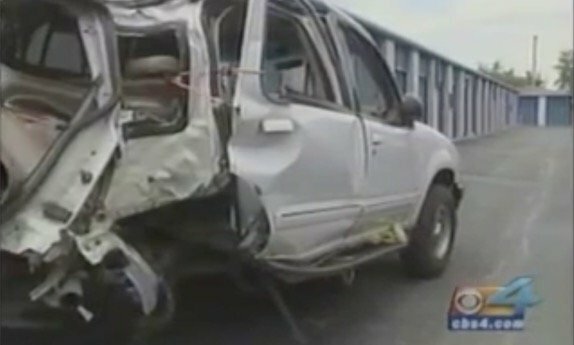 Some manufacturers fail to maintain internal quality control at an acceptable level, and some actively mislead outside inspectors to hide their lack of compliance with Federal Motor Vehicle Safety Standards. Tire Service Providers – Wholesale clubs, discount stores and national car service chains may offer great prices on tire sales and service, but they may not be staffed with experienced professionals who follow manufacturer recommendations when selling, installing or servicing tires. Service providers have been known to put the wrong tire on the car, put the tire in the wrong position, fail to remove a bad tire, or put on an old tire that is past its useful life. Tire Safety Tips – Maintaining your tires in good condition is critical to your safety. 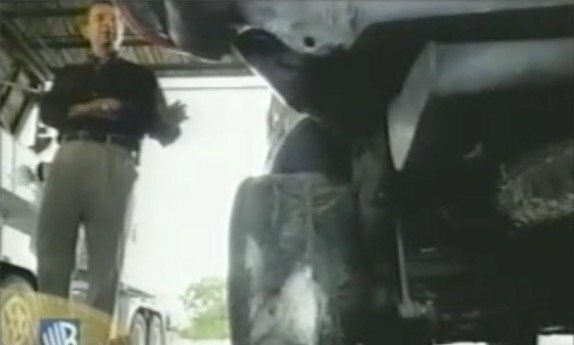 Get some valuable tips about how to keep your tires in good shape, learn what to do in case of a blowout, and find out what to do in case of an accident. 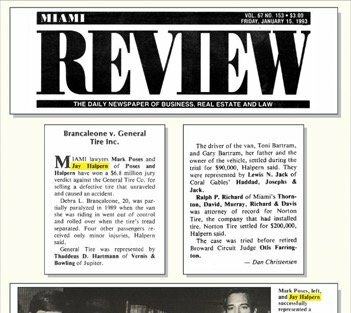 Referrals and Co-Counsel – We take cases across the country, including accepting referrals from local attorneys or joining forces with them to combine the needed experience and resources of a national firm with the knowledge of local court rules and a strong commitment to client service. 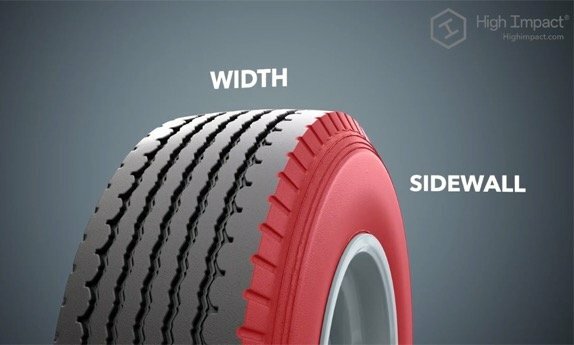 When you’re traveling down the highway or on busy city streets, your tires are the only thing between you and the road, and you need to be able to count on them to perform safely and effectively. When they don’t and tragedy strikes, another party may be responsible to cover the costs of your injuries. 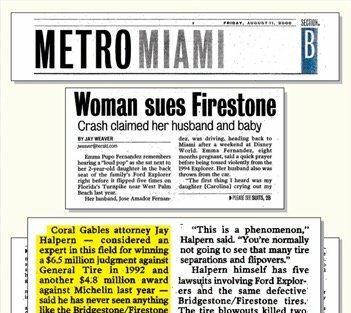 Find out if you have a tire litigation claim by calling Halpern Santos Pinkert in Florida at 305-445-1111 or toll-free nationwide at 877-529-6211. 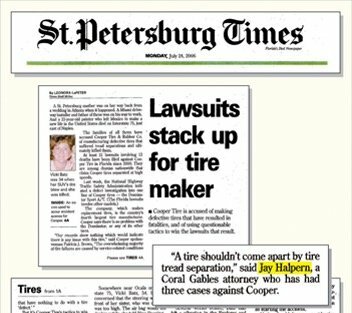 Our tire defect attorneys offer a free, confidential consultation and accept cases on a contingency fee basis, meaning we only charge a fee if we recover on your behalf. 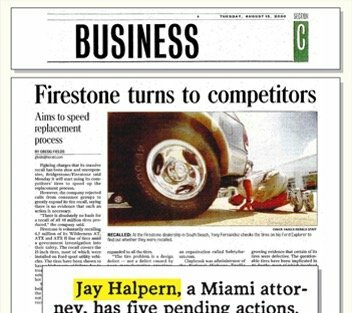 Our tire defect attorneys have gone up against every major tire manufacturer in the U.S. with resounding success. 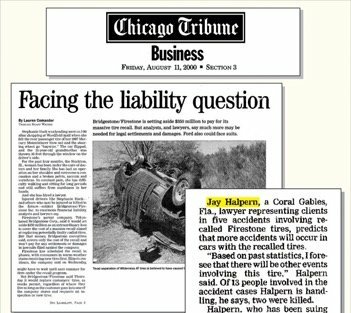 We understand tire defect accidents and what it takes to prepare and present a strong, persuasive case proving the defendant’s liability and the full extent of damages caused.  From the negotiating table to the courtroom, our firm has the resources, capability and dedication to see your case all the way through to a satisfactory conclusion.